When Julio Cesar Chavez fought against Pernell Whitaker in 1993, not only was he looking to become the best fighter pound for pound in the world, but he was trying to make boxing history by winning a title in a fourth weight division and becoming the first Mexican fighter to do it. But the crafty Pernell gave Chavez a boxing lesson that night and shattered the dreams not only of Chavez but of the entire Mexican people. In 1998 Julio tried to capture the WBC welterweight championship again and this time he lost by TKO at the hands of then champion Oscar De La Hoya. Chavez never got that fourth title in a fouth division, but his name in the history books is assured by winning the super featherweight, lightweight, and super lightweight titles. Another famous Mexican fighter tried to win that fourth championship, like Erik Morales and Marco Antonio Barrera, both were bitter rivals and after a fierce trilogy in which Barrera won two of the fights, they still share the same results as far as titles conquered by both legends Erik and Marco won the Super Bantamweight, Featherweight, and Super Featherweight championship. Erik morales faced David Diaz for the Lightweight title in 2007 and Diaz kept his belt with a disputed decision, Marco Antonio Barrera was trying to come back after a brief retirement but was stopped by Amir Khan in 2009, his quest was to defeat Khan and then get a title shot in a fourth division. Juan Manuel Marquez has tied Chavez, Barrera, and Morales' record by capturing titles in three divisions, the Featherweight, Super Featherweight and Lightweight, and now has a chance of a life time by facing Amir Khan for the WBA Super Lightweight championship and separate himself from the other Mexican greats. Khan has accepted the deal. He wants the fight, but it seems that Marquez has not made his mind about it. The Mexican media had Nacho Beristain talking about the fight and accusing Golden Boy Promotions of using Marquez as a stepping stone for Amir that recently signed a deal with Oscar De La Hoya which is totally false since Oscar and his team has always cared about the fighters specially the Mexican fighters. And Marquez is no exception, Oscar rescued Juan Manuel after years of sailing in obscurity and made him a superstar and one of the richest fighters in Mexican boxing history. The Khan fight is a generous offer to be in a big fight again after losing a one sided beating at the hands of pound for pound great Floyd Mayweather. But Nacho, who is a great trainer, but a terrible manager does not want the fight and there are reports of Juan and Nacho having serious issues. Beristain has not handled the career of the Marquez brothers too well, Rafael recently quit on Nacho and has a new trainer. And lets remember that he refused to accept $750,000 dollars for a rematch with Manny Pacquiao back in 2004 and sent Juan to get a fight in Indonesia against Chris John and lost his title for only a few thousand dollars. Dinamita Marquez has the quality, the skills, the power and that exquisite style, and the experience to defeat the glass jaw Khan and take his title. Let's remember that Amir does not take a punch well and Marquez is a natural counter puncher. It should not be an easy fight, but is a fight that Juan can win. I only can imagine what a great event it will be with thousands of British and Mexican fans in the arena rooting for their champion. Everything is on Marquez now. It is not Beristain's decision, and is not Golden Boy Promotions' decision. It is Juan who has to decide whether he takes the fight and wants to make history. It is a good fight for Juanma in every aspect. From an economic viewpoint it is great. From a historic viewpoint it is also great. Now it is all up to him. The current lightweight champion of the world can be the future super lightweight champion of the world. 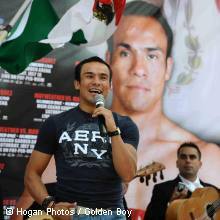 Juan Manuel the fourth world title awaits for you to become the greatest Mexican fighter of all time.